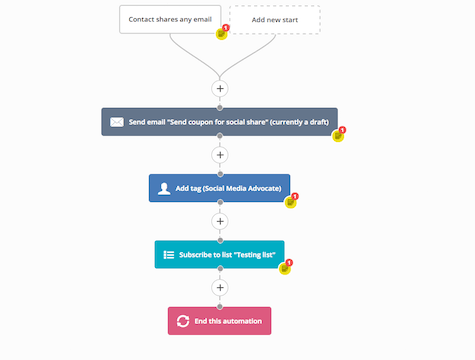 This automation is used to encourage people to share your campaigns on social media. If your campaign is shared, it can send the contact an email with a thank you and a coupon code in it. I have left this campaign as a draft so that you can pick the template you like best. It will also apply a tag “Social Media Advocate” so that you can track how often your campaigns are being shared and create segments of contacts that have shared in the past. It will also add them a list. I recommend creating a list along the lines of “Advocates” or “Raving Fans” so that you can leverage these promoters by encouraging and reinforcing advocacy.